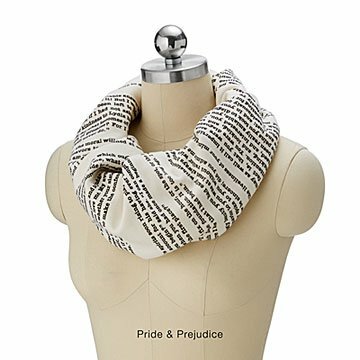 Get all wrapped up in a classic story and show some literary love with these bookish infinity scarves. Is it easy for you to get all wrapped up in a good book? Then these infinity scarves by Tori Tissell are the perfect way for you to show off some literary love in any weather. Each circular scarf is silkscreened by hand with passages from some of the world's great books, letting you cheer on Jane Eyre, go through the ups and downs of romance with Sense and Sensibility, take a tumble down the rabbit hole with Alice in Wonderland, or citations from Mr. Darcy with Pride and Prejudice. A great transitional scarf, they're made from medium-weight cotton knit, with a comfy, t shirt-like texture that keeps out the chill without being too heavy. Hand printed in Portland, OR. The order left to right pictured is: Jane Eyre , Alice in Wonderland, Wuthering Heights, Pride and Prejudice. Great quality and a unique product! Such a cute, unique scarf! My friend absolutely LOVES Jane Austen and is moving to NYC next year. This was the perfect, stylish gift for her and quite the conversation pieceâ€”we had never seen anything like it before. The material is really soft and feels very high quality. Looks and feels luxurious! Super soft. Classy, intelligent gift. I this as a gift to a trendy teacher friend. She was very excited to receive it. I bought this as a gift for my friend and she loved it! It was so popular in her house that her teenage daughter tried to steal it! I count that as a successful gift!